I’m going to venture a guess and say you have a Gmail account. Chances are, you have more than one. I say this with confidence knowing Gmail currently sports more than 1 billion monthly active users, up from a relatively paltry 425 million back in 2012. It’s free, it’s fast, it’s reliable, it offers ample storage for most users, and it’s relatively easy to organize, so it’s a prime choice for both business and individual users. But there are some things that keep Gmail from being a perfect system. While there’s an intuitive search feature (that can be modified with search operators) to help you find your long-lost messages, there’s no real way to gauge how you’re using Gmail – even simple things like how many emails you sent and received yesterday are difficult to figure out. That is, until now. 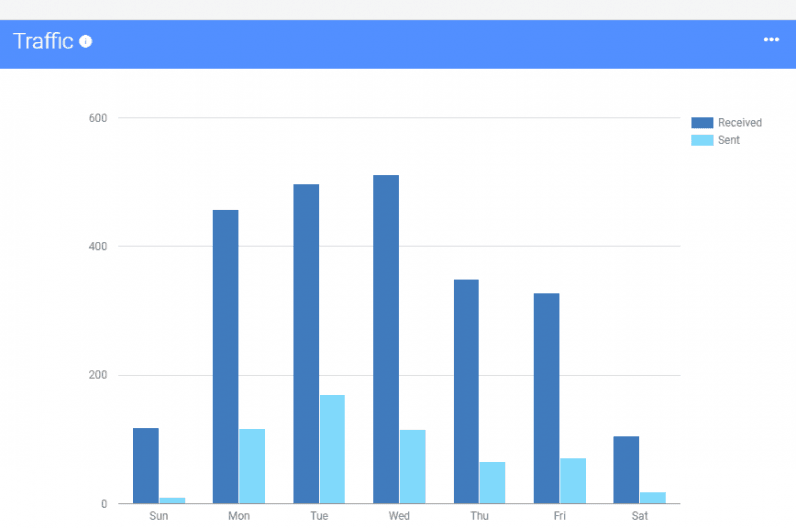 The recently released EmailAnalytics provides visualized analytics to help users understand email usage, with hundreds of data points and customizable visualizations that help users interpret and react to that data. The tool shows how many emails I send and receive each day, or within any given date range, so I calculate how much of my time and attention (or my employees’) is spent on email. The tool provides a visualized breakdown of hourly and daily use of email. Interestingly, I found that I send the most emails on Tuesdays, but receive the most emails on Wednesdays. As is typical, my email activity hits a valley around the weekend. The tool breaks down your top senders and recipients, helping you clearly see the distribution of your inbound and outbound messages. I found this helpful in identifying clients who take up the most of my time. Chances are, you have a few running conversations currently sitting in your inbox. The tool helps you understand how those conversations typically unfold; for example, how many conversations do you initiate, and how many are you roped into? How many emails are exchanged in a typical email thread? Interestingly, my average sent email contains 34 words, and the average email I receive contains 77 words. This is useful for gauging how my responses compare to other people’s responses. The app also tracks how long it takes you to respond to inbound emails, and how quickly people respond to yours. So how can typical Gmail users leverage email analytics data? Employee tracking and monitoring — In some ways, EmailAnalytics belongs in the same ranks as Toggl and TimeCamp, apps that actively monitor employee time expenditure and performance. The app enables users to identify top email performers, as well as problem workers who don’t use email as efficiently as they should. Personal productivity improvement — Some users will rely on the visualized insights for their own personal use, measuring how much time they spend on various email-related activities so they can improve in the future. Project ROI — Still others will use the information to determine how much time they spend on each project relative to how much money they have coming in from each one. If one client needs twice as much attention as another, but pays the same money, you have an asymmetrical ROI that needs to be corrected. As this is just the first iteration of the tool, it’s likely that there’s more to come. Google Analytics, a similar tool for measuring and analyzing web traffic, has undergone significant evolution over the years. With email being such a critical function for modern businesses (and individuals), this tool has the power to reshape our professional lives and potentially save hours of work each week. Perhaps soon, every method of communication we use on a daily basis can be analyzed so objectively. Read next: Are Asimov's Laws of Robotics still good enough in 2018?